1950. A love triangle. A secret attraction. A college student disappears in the woods. Ten years later, her rival lovers reunite in an attempt to solve the otherworldly mystery: what really happened to Clementine Yates? Four years in the making, playwright Maureen Gualtieri combines the pulp of lesbian fiction of the 1960s with urban legends about disappearances to investigate desire, discovery and a woman’s role in the world. 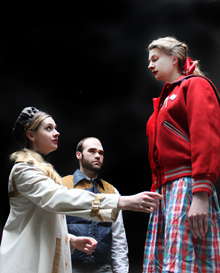 The script started shortly after her graduation from Montreal’s National Theatre School, where Maureen also met dramaturg Tara Koehler and actress Krystina Bojanowski, who stars as Clementine. Maureen’s previous Toronto Fringe credits include “Trip” and “Monkey Love”. Joining Ms Bojanowski in the cast is Ryerson student Mattie Driscoll as Matilda and accomplished puppeteer Jesse Byiers as Jerry, helmed by director Elizabeth Traicus. Traicus is an alumnae of Queens University and Humber College. Eerie, emotional and enlightening, “Odd One Out” brings its unique vintage and shadow-based aesthetic to the intellectual musings of Gualtieri’s script as part of the #FemmeFringeTO movement.